That year, these were the films that Paramount suggested people take their mother’s to see. 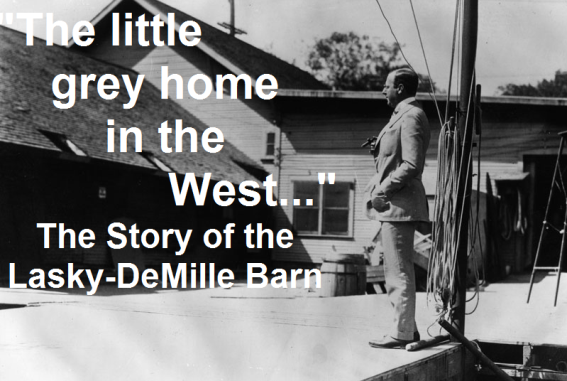 This month celebrates one-hundred years since director Cecil B. DeMille arrived in Los Angeles and rented a barn in the sleepy village of Hollywood to make The Squaw Man. Paramount Pictures traces its beginnings back to the founding of Adolph Zukor’s Famous Players Film Company on June 1, 1912. In 1916, Zukor merged his company with the Jesse L. Lasky Feature Play Company, and with the Paramount Distributing Corp., a subsidiary. 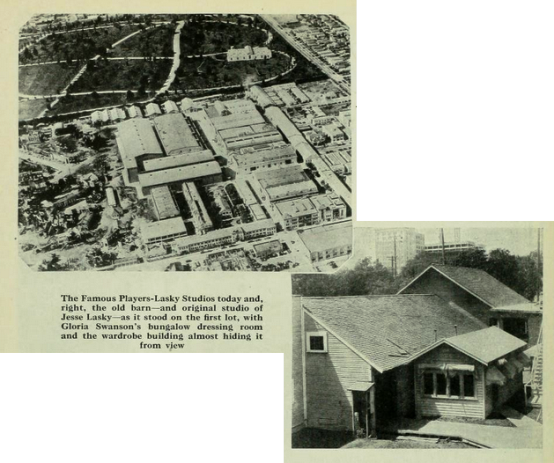 The new studio became Famous Players-Lasky Corporation and their films would be distributed under the Paramount name. In 1927 the organization was reorganized under the name Paramount Famous Lasky Corporation. In 1935, the Famous-Lasky name was dropped and the studio officially became Paramount Pictures. During Paramount’s acquisition of the Lasky Feature Play Company, the studio inherited an unpretentious, at least by Hollywood standards, wooden barn. The origins of that barn have had several incarnations. This is one version. “A portion of the motion-picture industry was built on that one word,” Lasky later said. After lunch they adjourned to the Lamb’s Club on West Forty-Fourth Street to discuss the details. At the club they ran into actor, Dustin Farnum and, while explaining their idea, asked him if he would star in a long feature they were going to produce. Looking around the room, Farnum saw Edwin Milton Royle the author of The Squaw Man. “You get Royle to sell you The Squaw Man and I might agree to join you,” Farnum told them. The Jesse L. Lasky Feature Play Company was formed with Lasky as president, Goldfish the general manager, and DeMille would be the director-general. They each held a quarter of the stock and Farnum agreed to take the other quarter instead of receiving a salary. They paid $15,000 for the rights to The Squaw Man. At first they planned to film it Fort Lee, New Jersey, just across the river from New York, but Lasky didn’t think that would satisfy DeMille’s penchant for adventure, so he suggested they go to Flagstaff, Arizona where he knew there were real Indians. “It did not seem necessary for us to go to the then new Hollywood, so we looked at the map and selected Flagstaff, Arizona, as a pretty good name for our producing town,” Lasky said. DeMille was agreeable but Farnum balked at the proposal. As long as he could live at home and work across the river he was willing to be paid off in stock, but if he had to travel across the country, he wanted his salary in cash. With the entire proposition on the verge of collapse, Lasky convinced his wife’s uncle and brother to invest and purchase Farnum’s stock. Reportedly, if Farnum had held onto the stock for eight years, he could have sold it for almost $2,000,000. The new producers hired a cameraman with his own camera and they engaged Oscar Apfel to help direct the production. Lasky and Goldfish remained in New York and attended to the sales and financial details as DeMille and Farnum took the train west. The barn that became their studio was located in a grove of orange and lemon trees on the southeast corner of Selma and Vine. Built in 1895, it was once a part of the estate of Colonel Robert Northam, whose mansion was located across the street where the Broadway building now stands. In 1904, Northam sold the estate to Jacob Stern, a realtor who, in March of that year, sold the barn to Harry Revier, a producer-director. In December 1913, Revier rented it to DeMille. Remodeling the barn into a studio to fit their needs began immediately. The horse stalls were removed and the space gained was transformed into a storage area for equipment the company hoped to buy. The carriage stand was turned into offices, a projection room and a primitive laboratory. The washing block was surrounded by walls and called a vault and the hay and feed section was made into an office, shared by DeMille and Lasky. A 30-foot square platform was built to adjoin the barn on the south side. This platform, the company’s first stage, was covered with a sail rigged to a mast, which could be adjusted to regulate sunlight. Shortly, DeMille wired Lasky that production was starting the next day. 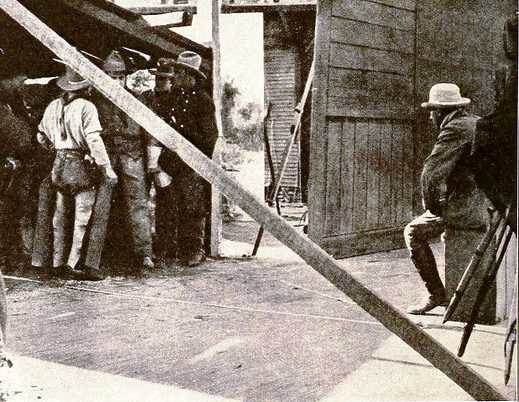 On December 29, 1913, DeMille ordered “camera” for the first scene of The Squaw Man. The excitement that the production was finally beginning convinced Lasky to come out to Hollywood. When Lasky arrived at the old Santa Fe Station, he told a taxi driver that he wanted to go to Hollywood. “He gave me a puzzled look,” Lasky recalled, “but said, ‘Get in boss—we’ll find it.’” After conferring with other drivers at the Alexandria Hotel, they found their way over dirt roads, past endless orchards and the occasional farmhouse until they came to the Hollywood Hotel. Lasky introduced himself to the clerk and made inquiries about the film company. “Perhaps I should have told you that the director-general of the company is Cecil B. DeMille,” Lasky stated. “Never heard of him,” the clerk said. Disappointed, Lasky was leaving when the clerk called him back. When Lasky heard “barn” he knew he had the right place. He found the barn at Selma and Vine with a sign that identified it as the Jesse L. Lasky Feature Play Company. When he opened the door he heard someone say: “There’s the chief.” Outside there was a two-ton Ford truck with the company’s name inscribed on its side. When DeMille saw him, he grabbed his hand and gathered the company around and gave a speech of welcome. Afterward he had a photographer take a photo of Lasky and the company against the truck. 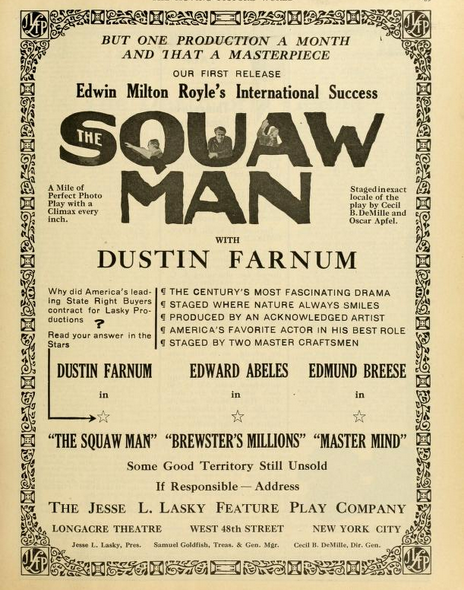 DeMille finished The Squaw Man in three weeks, and Oscar Apfel took over the one stage for his production of Brewster’s Millions (1914), another successful stage play. Edward Abeles, who had starred in the stage production, was brought to Hollywood for the film, which was followed by The Master Mind (1914) and The Only Son (1914). When The Squaw Man was released, Lasky received a telegram of congratulation from Adolph Zukor, then president of Famous Players. Lasky thought it was generous of him to do so and knew the value of the telegraphic dispatch so he asked Zukor’s permission to use his congratulatory message in their advertising. Further improvements were made on the barn and the studio lot. In May 1914, electrical illumination was used for the first time to augment sunlight, when tow spotlights arrived from the East and were used in the production of Steward Edward White’s story, The Call of the North (1914). Meanwhile, the studio was expanding. The platform attached to the barn was outgrown, and a larger, open-air stage was constructed. This received the title of Stage Number One, and when the end of this stage was glassed over, Stage Number One became the pride of the studio and the wonder of Hollywood. Sheds extending from the Selma Avenue side of the barn formed the cutting rooms, carpenter and paint shops, and the first dressing rooms were constructed. The first feature film to be made on this stage was DeMille’s Rose of the Rancho (1914). This picture marked a definite step forward in the life of the studio, for this was the first film which was shot, in part, on location away from the stages. At this period the first major influx of stars started. H.B. Warner, Max Figman, Theodore Roberts and Mabel Van Buren joined the Lasky forces. Dustin Farnum returned to the studio to star in the first film version of Owen Wister’s novel, The Virginian (1914), under DeMille’s direction. In the east, Marguerite Clark made her screen debut in The Goose Girl (1915). Stage Number One was inadequate to handle the expanding production of the studio and a barley field to the south was annexed and Stage Number Two, an exact replica of Number one, was constructed. Soon a third stage was built, and then a fourth. On June 28, 1916, the Jesse L. Lasky Feature Play Company was merged with Adolph Zukor’s Famous Players organization, whose most important asset was Mary Pickford. 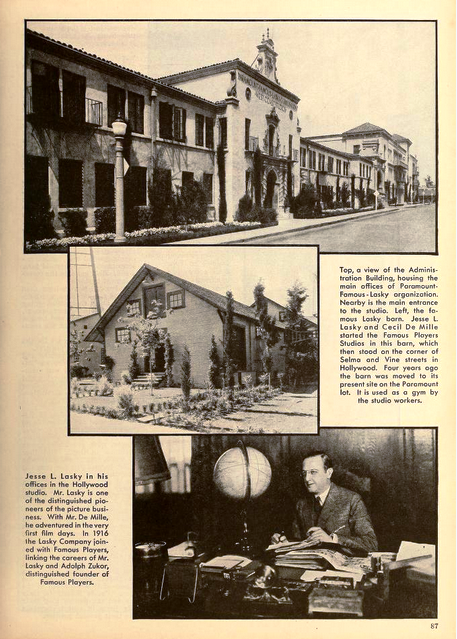 Zukor and Lasky combined forces and capital and purchased Paramount Pictures on July 19, 1916 and announced the formation of the $25 million Famous Players-Lasky Corporation, which included Paramount as its distributing channel. Zukor was elected president and Lasky was placed in charge of production. The Lasky Studios looking southeast from the corner of Selma and Vine. The barn is on the far left of the photo. Within three years they acquired the entire block between Selma and Sunset on which the former barn was located. The barn was transformed into a small property room and the business offices were moved into a new administration building which extended practically the length of the entire block facing Vine Street. A new glass stage was erected 60 by 200 feet, and another glass stage of the same length. 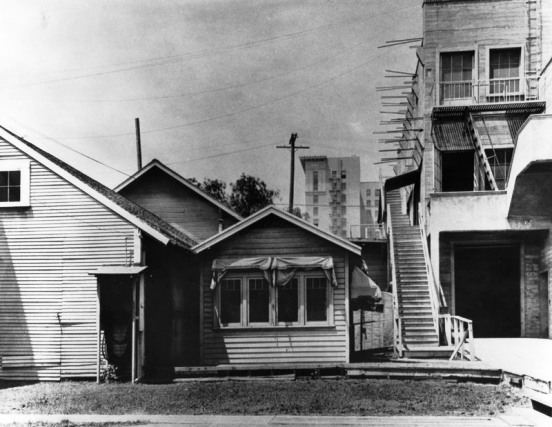 New carpenter and property construction shops were built 300 by 100 feet in size. The studio had extended its walls a full block. Further expansion continued and a vacant block on Argyle Street to the east was bought and was referred to as the “back yard,” containing fourteen garages and the street sets for outdoor filming. A new double deck paint frame was erected, eight times the size of the former paint frame, which at the time of its construction, was the largest on the Pacific Coast. Over 150 new dressing rooms were built for the stars, members of the organization and the extras. 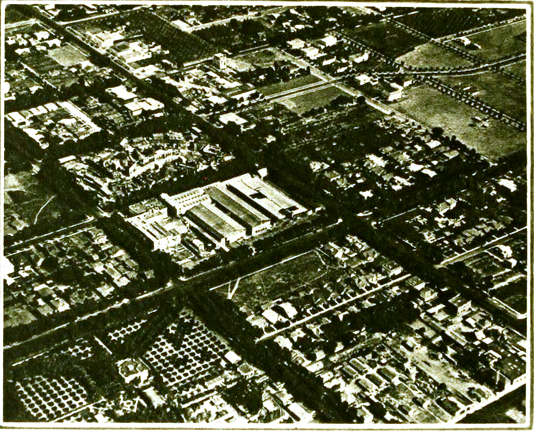 The studio also controlled the Morosco-Pallas Studios at Occidental and Council, and there, a new stage was built and the plant adjusted so that it could handle at least six companies. Beginning with a total staff of fifteen, just three years after The Squaw Man was completed the Lasky Company now had nearly a thousand on its weekly payroll. It had a complete printing plant on the grounds, which was used not only for printing sub-titles, but for preparing all stationary and the like. From having two automobiles, one of which was the personal property of Cecil B. DeMille, the Lasky Company now had fourteen cars, as well as three trucks. At the rear of the garages a complete machine shop was erected and all repairs were made by an expert mechanic and his crew. A concrete building was put up especially for the housing of transformers for the electricity for lights on the stages and the adjacent outdoor lot. A thousand-acre ranch near Burbank (now Forest Lawn-Hollywood Hills) was acquired as a site for out-door action. It was on this ranch that the studio’s growing collection of horses, cow ponies and cattle were held. On the studio’s twelfth anniversary, about 200 stars and well-known film executives attended and gathered in the old barn, now referred to as the “little grey home in the West,” for the celebration on December 14, 1925. 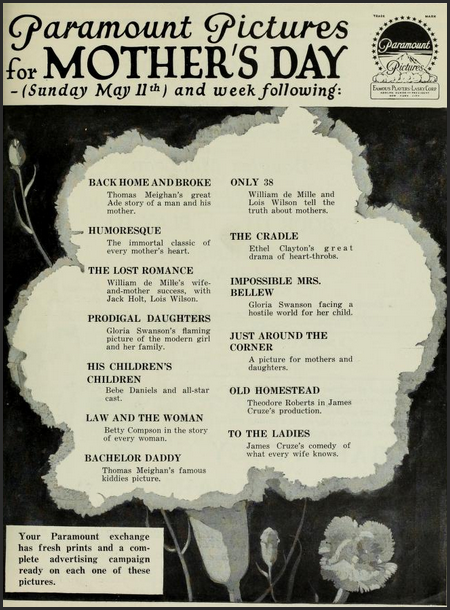 Those attending included Ethel Wales, who was a casting director, secretary and, when needed, a leading lady; Mabel Van Buren, James Neill, Theodore Roberts, Dustin Farnum and others. Lasky was presented with a bronze tablet which was placed on the spot where the old barn stood. At the time there were no plans on what to do with the old lot, but Lasky was sentimental about the old barn and the studios beginnings, so he had it picked up and trundled over to the new location. In addition, the window frame that he used to gaze out from was removed and placed in his new private office. Hollywood Cemetery and the new Cathedral Mausoleum on the far right. On the new Paramount lot, the old barn served as the studio library and later as the gymnasium. It became part of the studio’s western set, and a porch and railroad tracks were added outside. It was later used as part of the Bonanza television series set. 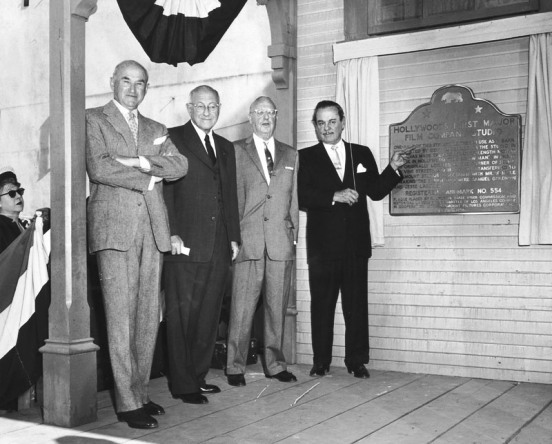 On December 26, 1956, the barn was dedicated as California Historical Landmark No. 554. Samuel Goldwyn, Cecil B. DeMille, Jesse Lasky, Leo Carillo. 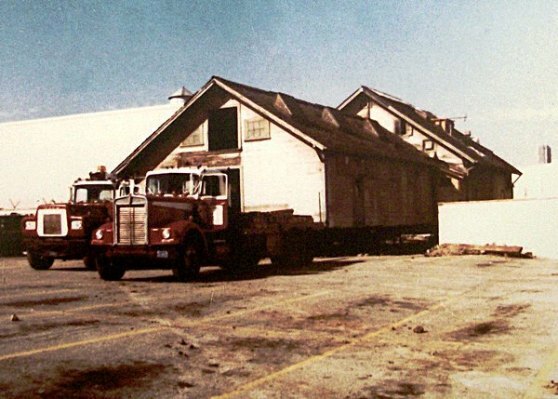 The barn remained on the lot until October, 1979 when Paramount gave the barn to the Hollywood Historic Trust, a cultural heritage arm of the Hollywood Chamber of Commerce. Until a decision could be made on what to do with the structure, it sat in the parking lot of Dennis Lidtke’s Palace, just north of Hollywood Boulevard on Vine Street. For the next three years it sat there becoming an eyesore to the community. Even though money was raised to restore the historic barn, there still was no permanent site to be found. When Jack Haley, Jr. wanted to film a television special at the Palace, he asked that the barn be moved. The Historic Trust offered to have the barn go to Universal, but preservationists knew it would become just another part of the studios tour. Eventually, Haley and Lidtke backed down on their request and the barn was allowed to stay until a site was found. The barn on the move. Meanwhile, Marion Gibbons, co-founder of Hollywood Heritage, and a board member of the Hollywood Chamber, proposed that her organization find the barn a permanent home. 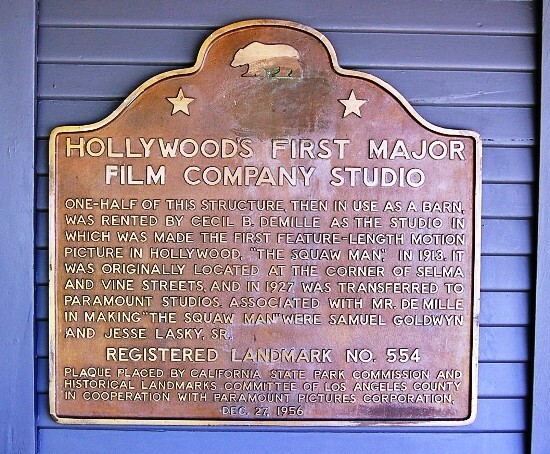 In May 1982, the Hollywood Historic Trust signed over the barn to Hollywood Heritage. They found a site on a grassy piece of land across from the Hollywood Bowl on Highland Avenue and signed the lease with the county on September 29 of that year. Gibbons and her volunteers finished painting the barn and getting it ready for removal from the Vine Street parking lot to the Bowl location. When completed, the barn was dedicated in December 1985 as The Hollywood Studio Museum. 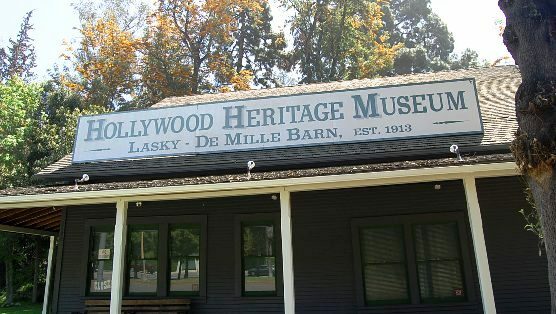 After a fire in September 1996, the museum remained closed until July 1999 when it was renamed the Hollywood Heritage Museum in the Lasky-DeMille Barn. When in Hollywood, be sure to visit the old barn where much of the early history of film took place. The museum is open from Wednesday to Sunday from noon until 4PM. For more information, visit their website at www.hollywoodheritage.org . Tickets for this event are available online with your credit card via Brown Paper Tickets. A nominal fee will be added to the ticket price for this service. Just go to: Paramount Pictures 100th Anniversary Celebration for more information. Or call 1-800-838-3006 to reserve tickets over the phone. Doors open at 7:00PM and seating is limited.